In your first few years of your working career, money can be tight. There are bills to pay, and you’d like to save and invest, too. With so many places to put your money, it’s easy to put insurance at the bottom of the list. And you’re young and healthy, right? Insurance can be dealt with later. It’s easy to feel this way, but not having a comprehensive insurance plan can leave you at risk. 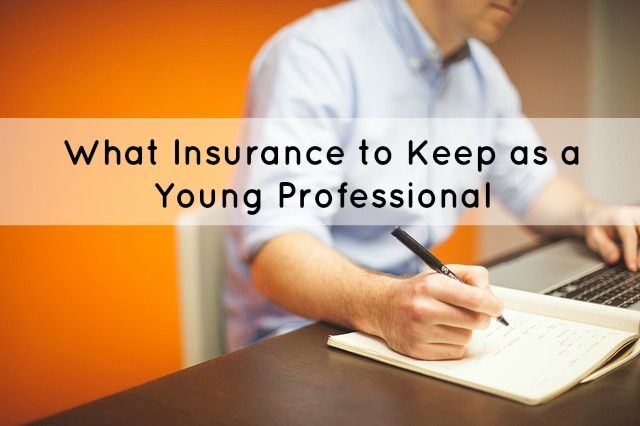 As a young professional, some types of insurance that are more appropriate than others. Let’s dig into what types of insurance you’ll want to make sure to buy, some you should consider, and some you should avoid. Since about sixty percent of bankruptcies occur due to medical debt, it’s wise to have health insurance to mitigate the impact of illness. Thankfully, most of us now have health insurance. Only 17.6% of Americans between the ages of 18-25 and 22.6% of Americans between the age of 26-34 do not have health insurance. As the Affordable Care Act continues to be implemented, this rate is expected to drop. With the introduction of the Affordable Care Act, all Americans are required to obtain health insurance or pay a penalty. If you are not eligible for an employer sponsored health care plan or a public insurance program like Medicaid or Medicare, you can obtain insurance through an approved private insurance policy. Individuals with an income less than $46,680 are eligible for subsidies. As a young professional, you might have accumulated some savings or investments. But with the vast majority of your earning years ahead of you, your largest financial asset is your ability to earn an income. Considering that over 25% of today’s twenty-year olds will become disabled during their working years, protecting your ability to earn with long term disability insurance is a smart move. Some amount of disability insurance is provided through Social Security. However, there’s a very strict disability definition. Any amount of work, even in a reduced capacity, can limit your benefit. Many employers also offer long term disability policies through a group plan. Read the fine print as these policies may also be limited. If your employer lacks adequate coverage or if you change jobs frequently, an individual disability policy will be useful. Licensed drivers need auto insurance with liability coverage. Liability insurance covers the injuries and property destruction you might cause to someone else. You also have the option to obtain comprehensive and collision insurance. Collision insurance covers your repair costs if you are at fault in an accident. Comprehensive insurance covers damage from a variety of sources, include fire, storms, theft, and so on. If you have a car loan, your lender will demand you obtain both collision and comprehensive insurance to protect their loan. If you are driving an older, inexpensive car, you can consider dropping coverage, especially if you have the financial resources to easily replace the car. More than three in five Americans under the age of 35 rent their homes. And while most homeowners have insurance as required by their mortgage lender, 60% of renters do not have a renter’s insurance policy. Renter’s insurance covers the loss or destruction of your possessions. Many policies also cover the cost of another apartment if you are unable to live in your own place due to destruction of the home. Renter’s insurance is often very affordable as the policy only covers your possessions and not the cost of the building. Your landlord’s insurance will cover the building. Replacing your mattress, TV, and computer would be expensive. Considering the low cost of renter’s insurance, it’s a good buy. If you do own a home, make sure to read the fine print to see what coverage is excluded in your homeowner’s policy. Many policies commonly exclude damage from flood, earthquakes, tornadoes, and more. If you at risk for a particular natural disaster that isn’t covered, supplemental insurance policies are available. Beyond protecting the basic needs of yourself and your stuff, what other kinds of insurance should you hold? That largely depends on your unique situation. If you’re young and healthy, do you need life insurance? If you have dependents that rely on your income, you do! This could be anyone: a spouse who couldn’t pay the mortgage on a single income, children, parents who need your financial help, and so on. Make sure to buy term life insurance if you want to include this protection in your financial plan. With this type of insurance, you pay a premium in order to obtain coverage for a set number of years. If you are young and healthy, term life insurance coverage will be inexpensive. You don’t want to spend more than you need on insurance as a young professional beginning to save and invest. Some types of insurance aren’t necessary or may not need to sit on the top of your priority list. While long term disability insurance is important for those at the beginning of their working career, short term disability can often be skipped. Many choose to save up an emergency fund to protect themselves from short-term financial disasters instead. Short term disability insurance only covers for illness. An emergency fund is much more useful for many people. This will protect your finances from unemployment, expensive car repairs, large medical bills, and any loss of income due to sickness. As discussed above, buying term life insurance can be a good decision. But whole life and universal life insurance rarely makes sense for those without a significant net worth. These types of policies are often used to cover business and estate taxes, and if you were to die unexpectedly, it’s doubtful you’d encounter these. Currently, only estates larger than $5.43 million in 2015 are subject to estate taxes. Some insurance companies tout these products as a way to invest while also getting insurance. However, you’ll make more if you just buy term life insurance and invest the difference. As a young professional, insurance might seem like something to be dealt with later. But unfortunate events do happen. With enough insurance, you can feel secure knowing that you are able to tough times without worrying about money.